The uncomfortable message was that many people who are top of the intellectual rankings are actually very poor learners. This sounds like a paradox. How can people be high-achievers and yet be unable to learn? Health care systems are stuffed full of super-smart, high-achieving professionals. The cream of educational crop. The top 2%. They are called “doctors”. And we have a problem with improvement in health care … a big problem … the safety, delivery, quality and affordability of the NHS is getting worse. Not better. Improvement implies change and change implies learning, so if smart people struggle to learn then could that explain why health care systems find self-improvement so difficult? The author, Chris Argyris, refers to something called “single-loop learning” and if we translate this management-speak into the language of medicine it would come out as “treating the symptom and ignoring the disease“. That is poor medicine. Chris also suggests an antidote to this problem and gave it the label “double-loop learning” which if translated into medical speak becomes “diagnosis“. And that is something that doctors can relate to because without a diagnosis, a justifiable treatment is difficult to formulate. We need to diagnose the root cause(s) of the NHS disease. The 1991 HBR paper refers back to an earlier 1977 HBR paper called Double Loop Learning in Organisations where we find the theory that underpins it. 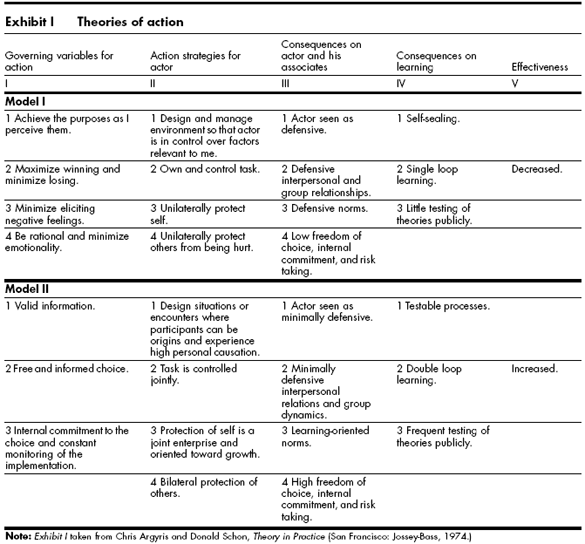 The proposed hypothesis is that we all have cognitive models that we use to decide our actions (and in-actions), what I have referred to before as ChimpWare. In it is a reference to a table published in a 1974 book and the message is that Single-Loop learning is a manifestation of a Model 1 theory-in-action. And if we consider the task that doctors are expected to do then we can empathize with their dominant Model 1 approach. Health care is a dangerous business. Doctors can cause a lot of unintentional harm – both physical and psychological. Doctors are dealing with a very, very complex system – a human body – that they only partially understand. No two patients are exactly the same and illness is a dynamic process. Everyone’s expectations are high. We have come a long way since the days of blood-letting and leeches! Failure is not tolerated. Doctors are intelligent and competitive … they had to be to win the education race. Doctors must make tough decisions and have to have tough conversations … many, many times … and yet not be consumed in the process. They often have to suppress emotions to be effective. Doctors feel the need to protect patients from harm – both physical and emotional. And collectively they do a very good job. Doctors are respected and trusted professionals. How many times have we seen this in the NHS? The Mid-Staffordshire Hospital debacle that led to the Francis Report is all the evidence we need. So what is the way out of this double-bind? Chris gives us some hints with his Model II theory-in-use. Free and informed choice – Plan. Constant monitoring of the implementation – Do. The skill required is to question assumptions and break through to fresh understanding and we can do that with design-led approach because that is what designers do. They bring their unconscious assumptions up to awareness and ask “Is that valid?” and “What if” questions. And the good news is that this Model II approach works in health care, and we know that because the evidence is accumulating.